ORANGE SINK: Queen of Hearts! Every now and then I hear someone say as they browse the pattern selection here in the studio that they are really not a heart person. suddenly my brain goes all heart wonky and I can't think of anything else! Anyone else experience this during these bleak and cold wintery days? Something about the heart, it's curvy and soft outline.... the way you can stretch it and mold it into interesting shapes and form..... the sight of it warms the literal heart! well... hooks be crazy and loops be loopy! 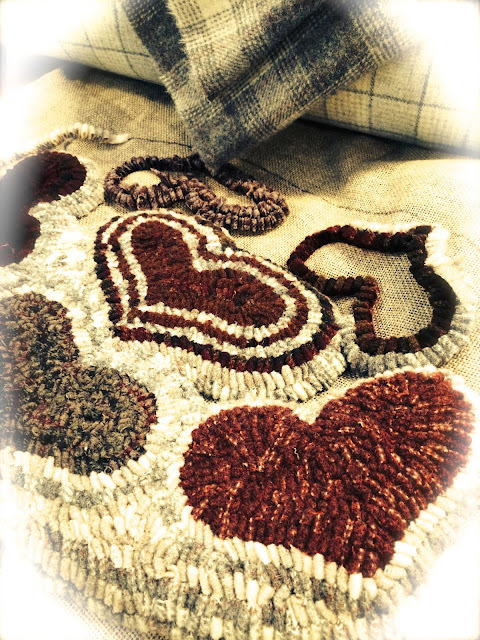 .... the hearts just popped onto the linen almost as if the Queen of Hearts dropped by and decided to hook herself a rug! How 'bout you? Are you a heart person? I Love hearts & have many thru my house ...... This rug you are doing is pulling at my Love for hearts ! I am more of a star person. But love the wools in yours. Very cute rug! Especially love the heart in the middle. Great job, Cathy. I too am not a heart person..but something about this time of year seeing everyone do wonderful heart projects (you included!) I can't help myself. 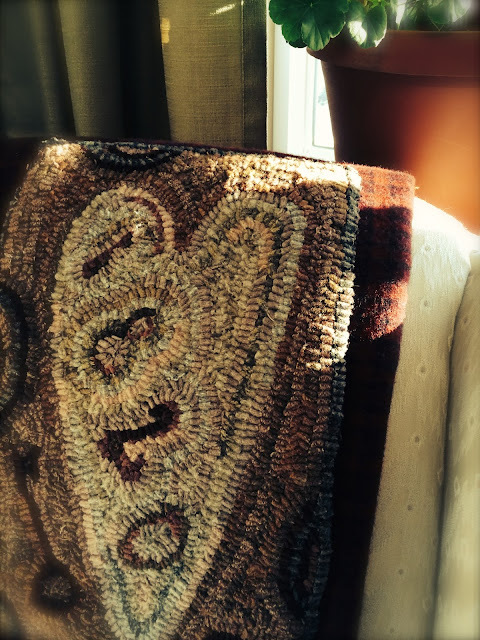 I think really it was your heart rug that set me off! Now this beauty..what's a gal to do? This is going to be awesome! Lovely wools! I'd say I'm not a heart person, but one of my favorite things to hook are hearts using hand torn wool. I also hooked your heart pattern. I hooked the antique adaptation Hearts and clover twice. Geez, maybe I am a heart person after all. Love your patterns. Working on some hearts now. I actually just bought some redware hearts. Love them. I love hearts, yours are wonderful! With a business called My Primitive Heart and a blog called Primitive Heartstrings, I guess I would call myself a heart person!! lol I actually LOVE HEARTS!!! Your rugs are just AMAZING and make my heart skip a beat or two!!! Stay safe and warm and happy hooking! I have lots of heart rocks. Can't go to a riverbank or creek without walking around staring at the ground looking for heart shaped rocks! I do like them but this time of year, just like you!!! In fact that is what I need to be hooking instead of being on the computer. :) Have a nice weekend Cathy. I am not a "heart" person although I have several heart patterns on my "to-do" list. Valentine Day has never been big for me but St. Patrick's Day is another story. Love your comment "hooks be crazy and loops be loopy". It's Been Awhile~But Now There's Tile! Taking The Plunge Into 2016!